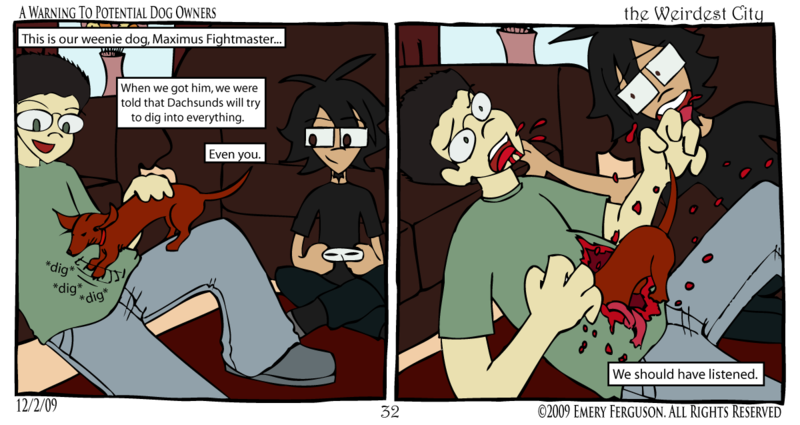 Both Max and my brother appeared in the comic a while back, in the same panel too. Max is a Wiener Dog, and as such he loves to dig. I read up on this over the summer before we got him, but I really could not have imagined the extent to which this was true. Weenie dogs are bundles of energy. They can play for an hour, rest for five minutes, and then be totally re-energized. Keeping up with them can be difficult even for small children who are probably the only creatures in existence that could possibly match their desire to play. Needless to say, Max destroyed a lot of furniture (and also my favorite pair of pajamas) before we figured out how to channel all that energy. Turns out the easiest way is just to take him outside, play with him, and let him dig up the yard to his heart’s content. Also, walks are good. We adopted Max from the animal shelter after no one came to claim him for weeks, and he is quite a lovable addition to the family. Dude knows how to make us laugh, that’s for sure. He makes a terrible guard dog since he considers everyone his friend, pretty much. I imagine that his love for people is matched only by his curiosity.